You are in Zapatista Territory. Here the people command and the government obeys! Winds are blowing today, similar to those that blew 20 years ago in the Mexican elites. At that time Carlos Salinas de Gortari felt invincible, much like Enrique Peña Nieto does today. His project to reform Mexico in an authoritarian and vertical manner was advancing without major obstacles, and was being advertised as overcoming myths and historical atavism. He had already laid the foundations of a trans-sexennial power. His approval ratings in public opinion were skyrocketing. The reforms to Article 27 of the Constitution, which privatized the ejido and opened the way for land concentration in the countryside, were approved without major mishaps. The same thing happened with the amendment to Article 130, which granted political rights to the clergy. At the signing of the North American Free Trade Agreement (NAFTA) an age of abundance, progress and prosperity was announced. The emergence of the Zapatista Army of National Liberation (EZLN) in January 1994 overturned that picture dramatically. It derailed the trans-sexennial project of Salinas, dynamited the authoritarian presidency, put the indigenous question in the center of the public agenda, unmasked the government project to combat poverty as a sham, opened spaces for the expansion of a wide variety of political and civic forces which had been blocked politically, forced the citizenization of the Federal Electoral Institute (IFE), laid the foundations for the political reform of 1996, ended the reign of the two hegemonic political-cultural blocs and oxygenated public debate on the country’s fate. The Zapatista Uprising won, in a very short time, a huge social legitimacy, which was politically and legally recognized, first in the Dialogues of the Cathedral, and then in the Law for Dialogue, Reconciliation and a dignified Peace in Chiapas. That commitment to their cause was not unrelated to the devastating effects of the “modernizing” reforms of Salinismo among broad sectors of the population. Many victims saw the insurgents as their avengers. The rebels justified the armed uprising, in part, by the counterreform to article 27 of the constitution and the signing of NAFTA. The emergence of the Zapatistas did not stop the cycle of neoliberal reforms, but its promoters were forced to delay them. While it made evident a crisis of political representation in which society does not fit into the regime, and it was a real factor in pushing political change, it did not have sufficient strength to limit the ‘partyocracy’. Nor could it occupy a permanent place at the national political table. This was palpable on at least three separate occasions. First, in 1996, with the government’s failure to fulfill the San Andrés Accords, and the signing of the Barcelona Accords, by which they agreed to a new political reform that led to a real sharing of power between the three main parties. This negotiation reinforced the party monopoly of political representation; left many of the political and social forces not identified with these parties outside the institutional spaces; and preserved almost intact the power of the leaders of corporate mass organizations. In spite of these blocks, the EZLN continues to be a strong force for transformation and an indisputable reference for a wide archipelago of social organizations in the country. Without asking permission, the rebels govern themselves, exercise justice, are responsible for the health and education of their people, and exercise the right to self-defense. Only a year ago, on December 21, 2012, they showed their strength by mobilizing, in silence, 40,000 support bases in an orderly and disciplined manner. 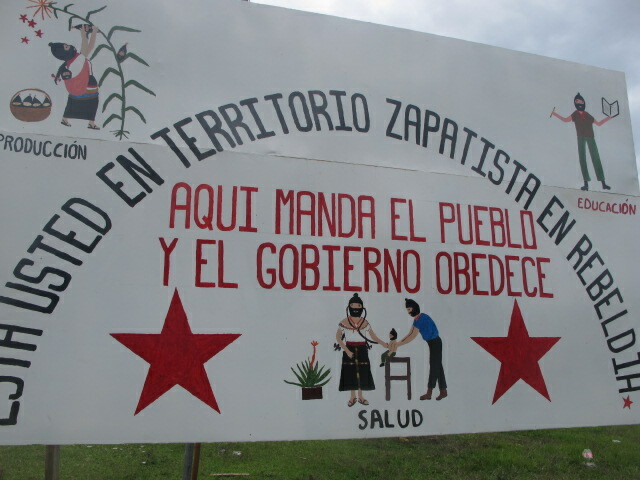 In August 2013 supporters from almost every part of the Republic attended the Little Zapatista School (escuelita zapatista), a tremendous learning experience. At the end of the event, hundreds of representatives of indigenous peoples from throughout the country made, together with the rebel commanders, the Juan Chavez seminar into a central moment in the reconstruction of the Indigenous National Congress. Thank you for posting this. I realize that political structures and perspectives may differ widely between different countries but this succinct summation of the effects of the Zapatistas Mexico over the last 20 years directly illuminates the current breakdown of democracy in the US. The parties no longer represent the majority of the people. They are widely known to be working for the corporations and the elites. If Americans could see how indigenous values and perspectives actually solve the problems we all face by giving everyone a voice i believe we could overcome the seemingly insurmountable divisions and as the Zapatistas did, disrupt the project of elite globalization. Unfortunately it may take the level of physical hardship common in Chiapas to break Americans mental programming away from the party/hierarchy.